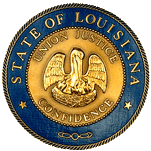 SCR20 ERDEY MOTOR VEHICLES - Expresses intent of Legislature of Louisiana for enforcement of laws regulating glass tinting on all private passenger vehicles. SCR36 ERDEY TRANSPORTATION/DEV DEPT - Requests DOTD to study the feasibility of new interchanges on I-12 at LA 1032 (4H-Club Road) and at LA 16 (Pete's Highway). SCR37 TROY BROWN ROADS/HIGHWAYS - Creates a task force to study the installation and maintenance of lighting on the Sunshine Bridge and the Veterans Memorial Bridge in Gramercy. SB349 T.CARTER MOTOR VEHICLES - Provides relative to driver's education. (8/1/16).